President Barack Obama announces sweeping changes to U.S. surveillance efforts exposed by intelligence leaker Edward Snowden, whose disclosures raised questions about government overreach in fighting terror. Follow this live blog for updates and analysis. "One thing I’m certain of: this debate will make us stronger. And I also know that in this time of change, the United States of America will have to lead." "It may seem sometimes that America is being held to a different standard, and I'll admit the readiness of some to assume the worst motives by our government can be frustrating. No one expects China to have an open debate about their surveillance programs, or Russia to take the privacy concerns of citizens into account. But let's remember that we are held to a different standard precisely because we have been at the forefront in defending personal privacy and human dignity." "As the nation that developed the Internet, the world expects us to ensure that the digital revolution works as a tool for individual empowerment, not government control. Having faced down the dangers of totalitarianism and fascism and communism, the world expects us to stand up for the principle that every person has the right to think and write and form relationships freely – because individual freedom is the wellspring of human progress." "Those values make us who we are. And because of the strength of our own democracy, we should not shy away from high expectations. For more than two centuries, our Constitution has weathered every type of change because we've been willing to defend it, and because we've been willing to question the actions that have been taken in its defense. Today is no different. I believe we can meet high expectations. Together, let us chart a way forward that secures the life of our nation, while preserving the liberties that make our nation worth fighting for. Thank you, God bless you. May God bless the United States of America." The President's speech was about 43 minutes. Analysis of Obama's #NSA speech on CNN now with @wolfblitzer @jimsciutto Spider Marks, Gloria Borger. After my years of #bipartisan work & ongoing efforts, Pres. Obama took big steps forward today on #NSA reform. Senator Rand Paul live on CNN now reacting to Pres. Obama's #NSA speech. Rand Paul on CNN: "I think what I heard is that if you like your privacy you can keep it." On CNN, Sen. Rand Paul, R-Kentucky, said he didn't hear "any lessening of the spying on Americans" but simply heard the President say "trust me" with individuals' information. "This is something that's going to have to be decided by the Supreme Court," said Paul, who's been a strong critic of the NSA programs. "I have no objection for having a warrant for a specific person and specific phone calls," Paul said. But he said there needs to be one warrant for each suspect, not just one warrant for a suspect and other people that person spoke with. Coming up at 1pmET Sen. Sanders will be on @CNN talking with @WolfBlitzer about the #NSA and President @BarackObama 's speech. "He's not going to fundamentally change any of this," Paul said. "What he's talking about is a different kind of country than our founding fathers envisioned." Question: will this speech boost intel reform wing in Congress or set it back? I think it helps them and could lead to more robust reforms. Paul said he likes the provision in which the Obama administration would add a public advocate to the federal surveillance court, but he cautioned that the advocate shouldn't be appointed by the executive branch. Sen. Rand Paul gives Obama's speech an "A" for effort and a "C" for content. "He says the right thing, I think his heart is really in the right place, and his motives are not bad...but I don't think there's enough of a healthy respect for the Fourth Amendment." Rep. Adam Schiff (D-CA), a senior Member of the Intelligence Committee and sponsor of several pieces of legislation to reform the NSA, said he was please to hear that Obama favored allowing a "privacy advocate" on the FISA court. "However, the devil will be in the details. Specifically, I believe this ‘public interest advocate’ should only be appointed in certain cases involving programmatic requests and novel legal and technical issues. I also believe the advocate must be truly independent and have access to the technical expertise necessary to independently evaluate the government’s arguments before the FISA Court. My legislation would create a pool of private attorneys with sufficient clearance and expertise to serve in this crucial role." "Thank you Snowden" campaign organizers were not pleased with the speech. "Rather than dismantling the NSA’s unconstitutional mass surveillance programs, or even substantially restraining them, President Obama today has issued his endorsement of them,” stated Mara Verheyden-Hilliard, constitutional rights attorney and executive director of the anti-surveillance organization the Partnership for Civil Justice Fund. CNN Chief Political Analyst Gloria Borger: "What the president did today is he raised all the questions, but he didn't have a lot of the answers." 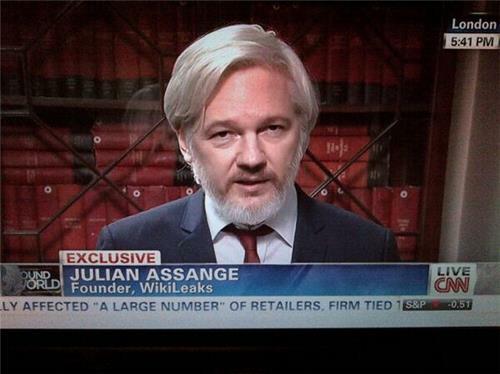 Next on CNN, @SuzanneMalveaux speaks to @wikileaks founder Julian Assange to get his reaction to Obama's #NSA speech. "I think it's embarrassing for a head of state like that to go on for almost 45 minutes and say almost nothing," Julian Assange says on CNN. Assange says his greatest concern was "what was not said," adding "there (were) no restrictions" mentioned for the FISA court. "The United States has become the archipelago of coercion," Assange says. "I think Edward Snowden today would be quite happy that at least there is 45 minutes of a president speaking about these issues," Julian Assange says on CNN. "When there's a failure of internal oversight, other people have to step into the role," says Assange, "That's what Edward Snowden has done." Julian Assange says Edward Snowden will respond to the President's speech early next week. Bernie Sanders (I-VT) to Wolf Blitzer: "In a very significant way the President began the conversation on what is a very difficult and very complicated issue... we've got a long way to go."